Nest is the ultimate collection of practical, space-saving kitchenware comprising a unique range of food preparation sets. Their innovative design allows the individual elements within each set to be stacked together, thereby occupying the absolute minimum amount of space. Nest 7 Plus is a new addition to the range with an updated design and several practical new features. Both mixing bowls now have non-slip bases and wider carry handles and the measuring cups have been redesigned to 'snap' together more securely. An additional spoon in the centre means that measurements from 1 teaspoon (5 ml) up to 1 cup (250 ml) can now be made. 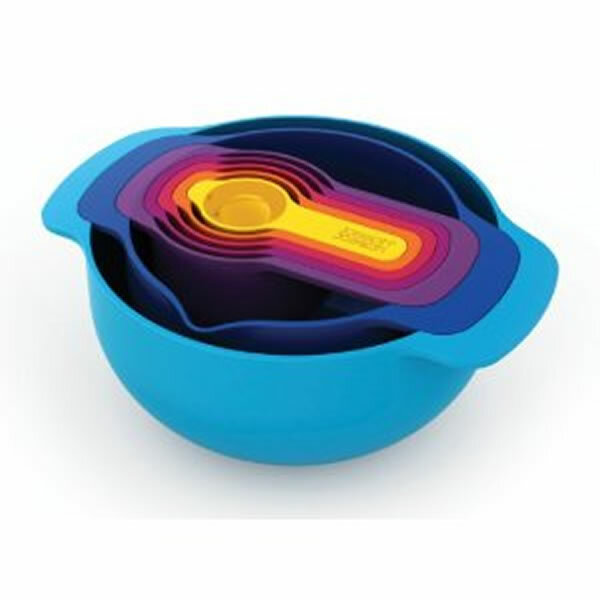 The small mixing bowl still includes measurements inside for added convenience (ml/fl.oz) and a spout for accurate pouring. Nest 7 Plus comprises: 5 x measuring cups 1 x small non-slip mixing bowl with measurements 1 x medium non-slip mixing bowl All pieces are dishwasher safe.